Paranormal activity like seeing a ghost had been part of the modern culture. 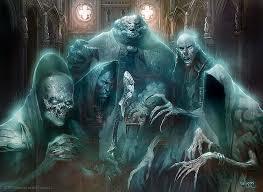 The story of a ghost or poltergeist haunts lots of people though there's only limited evidence to support such account. Surprisingly, if we are going to classify the types of ghost they had witnessed, categories can be made. 1. White Lady - The most common ghost you may see inside the abandon house. Wearing a white dress, around in their twenties, you can see this type of ghost in any part of the house. 2. Black Lady - If there's white then there's black. Obviously, people just categorize this ghost due to the color of the dress or clothes. However, other claimants would say that the nature of this type of ghost is bad and more violent compared to white lady. 3. Innocent Baby - Have you heard a sound of baby crying inside an abandon house, and when you look over, nobody is around? It's really sad to think that a baby who doesn't understand anything could do some haunting. However, some paranormal experts believed that the demon, another entity, is responsible for creating a sound of baby,frightening people. This assumption is based on the theory that the motive for haunting resulted from un forgiveness is a thing that a newborn could not understand. Thus, the idea of baby that haunts people is not plausible and only created by demon. 4. World War Soldier - The past generation created a chaotic world and caused sufferings to many people involved to war. Brave men who just died in an instant during the state of war could not accept the fate and end up lurking in the place where they died. The time came when a family built a house on the place where most of these soldiers died, and so, the haunting begins. Just any other ghost, except the baby, unfinished business drive soldiers to seek justice to their death, and as they want to say something to their loved ones. 5. Beheaded priest - A church renovated to a house or vice versa, this type of ghost might be present there. It's surprising to think that their souls couldn't rest and want some justice. There is an account in the past where many priest were executed, leaving the possibility that they are included to these group. 6. Nun - It's not surprising to hear ghost stories involving nun to be particular. Such tale could include hearing the crying sound of nun, but only assumed it was from a nun; or the clanking chain, and again, claimed to be tied on the nun's leg. 7. Slave - In the past, slavery is very common and still exists to some parts of the world. Maltreatment and abuse that most likely ended up killing the slaves makes their souls retain on Earth, seeking for justice. 8. Wicked Landlady or Landlord - One's wickedness makes the soul unhappy. They might not seeking revenge or justice and inflicted suffering to other people instead, but their longing for the possession taken away by death, makes their soul still lurk inside the house. Greediness over possession even after death doesn't make them rest in peace. 9. Witch - If ever you had watched the movie "The Conjuring", then be scared. Disembodied soul of the witch after death is really hard to handle, that the help from paranormal expert and/or a person specializing to counterattack black magic is needed. If ever you dwell in a house with the ghost of a witch, it's really a big trouble. 10. Member of Cult or Satanism - The hunger for immortality is one cause why some souls couldn't rest peacefully, rejecting the idea of death. Thus, before one could finally meet his end, the person used black magic, so whenever the person died, he or she still has access to the world of the living . They use an object in the house as portal, like the mirror. Beware!